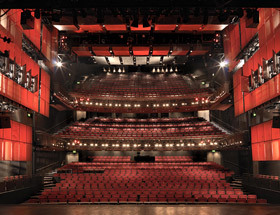 Sadler’s Wells is a world-renowned dance, performance and events venue. A modern conference facility with state of the art sound and lighting equipment and a full technical team to ensure your presentation stands out. The Rosebery Room is ideal for workshops, conferences and meetings with a full AV system and a glass wall for plenty of natural light. One of our most popular theatre spaces for conference and seminars as well as performances and film screenings. The theatre combines state of the art events facilities with real theatre atmosphere. The Mezzanine is a light and airy space with the feel of a contemporary gallery, ideal for large receptions. Our Circle Bars are modern, light, open plan spaces with plenty of natural light. This flexible space offers an ideal environment for small training seminars or workshops. Flexibility is at the heart of our venue and events can be hosted in cabaret, boardroom or classroom style. 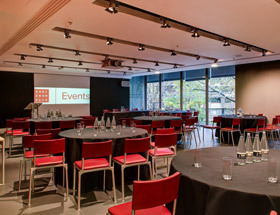 Our meeting spaces are fully accessible, and are complete with full AV facilities as standard. Workshops, boardroom meetings and press launches are well accommodated in the modern and light space. The Pina Bausch Room is also an ideal space for VIP receptions and private parties. 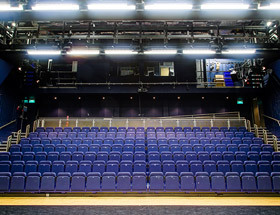 Sadler's Wells West End venue is newly refurbished and is perfect for evening performances, awards ceremonies or gigs.